Chicks and hens (Sempervivums) belongs to the Crassulaceae family. A hardy perennial, this succulent adapts to even the poorest soil conditions, making it suitable rock gardens and xeriscaping. Tolerant to elevations up to 10,000 feet, chicks and hens thrives in alpine gardens, too. 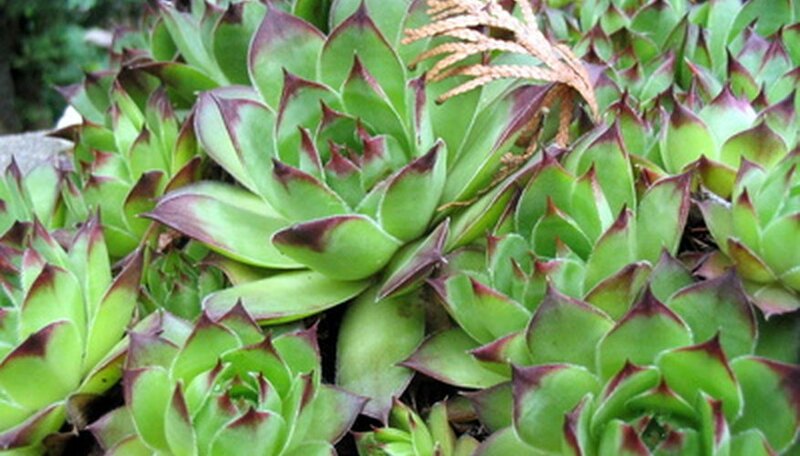 Plants form a low-growing, dense mat of succulent-leaved rosettes in pinks, reds, purples and greens. Pink or white blooms form in summer. Gardeners who add chicks and hens to their gardens will find the plant relatively maintenance-free. Select an area in your garden situated in full to partial sun if planting chicks and hens directly into the ground. The plant requires some amount of sunshine throughout the day for proper growth. Choose an area where the soil drains very well and does not hold water, as chicks and hens will die of root rot if planted in saturated sites. Succulent plants do not require a consistently moist soil medium to thrive. There is no need to amend the soil with organic materials. Dig a planting hole slightly larger than the root ball and as deep as the plant in its container. Remove the chicks and hens from their container and place the root ball inside the planting hole. Cover the roots with soil and pack it firmly around the base of the plant. Water the chicks and hens after planting, and water the plant approximately once a week depending on your weather conditions. Chicks and hens are very drought-tolerant once established in their planting site and will tolerate long periods with no water. Select a container with drainage holes in its bottom that is approximately two to three times larger than the chicks and hens' root ball. Chicks and hens will develop root rot and die if planted into a container that holds water and does not drain properly. Fill the container two-thirds full with a well-draining potting mix. Planting the chicks and hens in a soil medium that retains water will cause the plant to rot and die. Remove the chicks and hens from their original container and place inside the new container. Cover the root ball with soil, planting no deeper than it was originally growing. Water the container until water runs from the bottom. Continue to water the container approximately once per week when the soil begins to dry out. Situate the container where it will receive full to partial sun throughout the day. Propagate chicks and hens by dividing the plant's tubers and planting into a new planting site or container, or by rooting leaf cuttings by placing the leaf-tip end into the soil. Water as usual. There is no need to fertilize chicks and hens. Pests are not a problem with chicks and hens.